Chrome resists heat. Chrome resists wear. 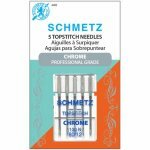 SCHMETZ Chrome is the perfect partner for power sewing, quilting and embroidery.